This is the age of in-your-face marketing and so, you have to make use of multiple avenues to promote your products or services. Gone are the days when a customary advertisement in print and electronic media was enough to attract customers’ attention and thereby trigger sales. Now, you have to walk that extra mile or do something out-of-the-box to get heard or noticed. Promotional marketing has undergone a huge transformation in the last few years, with several new and interesting avenues of advertisement coming up and gaining ground steadily. One such technique is indirect promotion. This can be best illustrated with the help of an example. If you have visited any relative or friend’s house of late, you must have come across those useful classic bean bag chairs in some homes at least, if not all. Did you notice them carefully? If you have, you must have seen a company’s name mentioned prominently, not necessarily of the manufacturer of those bean bags. It may be of a fitness center or a toy shop. What does it signify? It suggests that the concerned company has chosen it to promote their goods or services. This is nothing but indirect marketing which can be very helpful, particularly in the present scenario when competition is so stiff. What is the use of such indirect marketing and why are products like bean bag chairs used for the purpose? The logic is very simple. It always makes sense to choose a promotional platform that has a wider reach. Now, bean bags are a constant in every home in today’s time. This is because they are highly comfortable and can be moved easily from one place to another. Shifting them to a different room or carrying them along with you on picnics and getaways are not a problem at all. Moreover, they are washable and easy to maintain. All these reasons make bean bags a very popular item of furniture, particularly when compared to conventional furniture seating. 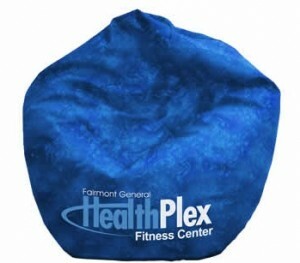 In such a scenario, if classic bean bag chairs are used for the purpose of advertising a product or service, it can ensure greater visibility and prominence. Just consider the scenario. The person or family buying the bean bag may not be interested in the service advertised in it but people visiting their home may be drawn towards it or find it helpful. This way, you can reach out to a whole new set of prospective customers. For this reason, it is advisable to try out these economical yet effective bean bag chairs. While deciding on the content to be displayed on the classic bean bag chairs, you should keep in mind its size limitations. Ideally, the message should not contain anything more than the name of the company, its service explained as briefly as possible, for example ‘fitness center’, and contact number. The last one is very important because it can prompt a prospective client to take immediate action. Remember no one is going to go back home and search for your company’s name on the net for further details. Therefore, make best use of the promotional opportunity you get with bean bags.